The church's congress has issued an address to the ecumenical patriarch. 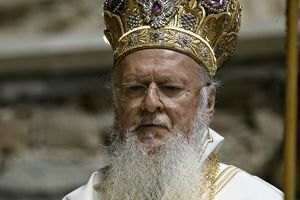 The congress of the Ukrainian Autocephalous Orthodox Church (UAOC) has addressed Ecumenical Patriarch Bartholomew with request to accept it into the Constantinople patriarchate with the same rights the Ukrainian church had had before 1686, the Religious Information Service of Ukraine has said on its website. "We are addressing Holiest Patriarch Bartholomew I, the archbishop of Constantinople-New Rome, with request - for the sake of consolidating the entire Orthodox church on the territory of Ukraine, overcoming the division among Ukrainian Orthodox believers and establishing the single local autocephalous Ukrainian Orthodox Church - to accept the Ukrainian Autocephalous Orthodox Church into the Constantinople mother church as the Ukrainian church with the metropolia centre in Kyiv before 1686 and in accordance with the decisions of the holy and great Orthodox congress in Crete on 2016 to grant churches autonomy," the statement reads. The decision to this effect was taken at the UAOC congress on 5 July.